Skipstroyggjan is one of the most iconic symbol of Faroese knitting. It was originally used when the Faroese went out to sea to fish. The jumper was knitted with a 100% natural Faroese yarn of a mixture of fine inner wool and coarse outer wool, Samfingið tógv, making it especially strong and suitable for this kind of outer garment. This mixed wool has a lot of character, the overhair is still in it, giving it a different texture. The wool is not chemically treated, originally it was only washed in urine before rinsed in fresh water, hence the yarn maintains the high content of natural lanoline in the wool. It is this high content of lanoline in the Faroese wool that makes so much of a difference. In the wild climate of the Faroe Islands, the Faroese sheep have evolved so they grow a thick coat with a rugged texture with this high content of lanoline. But the rugged texture also makes the mixed wool, used for the Skipstroyggja, a somewhat harsher wool, and for some it may feel coarse – but with usage it gets softer and lighter and for most people it will hold for a lifetime. And then there is one extra advantage, again, due to the lanoline it is more or less self-cleaning, so unless you stain it, there’s little need to wash it, just hang it outside to get some fresh air once in a while. This mixed wool has a lot of character, the overhair is still in it, giving it a different texture. The wool is not chemically treated, originally it was only washed in urine before rinsed in fresh water, hence the yarn maintains the high content of natural lanoline in the wool. It is this high content of lanoline in the Faroese wool that makes so much of a difference. In the wild climate of the Faroe Islands, the Faroese sheep have evolved so they grow a thick coat with a rugged texture with this high content of lanoline. But the rugged texture also makes the mixed wool, used for the Skipstroyggja, a somewhat harsher wool, and for some it may feel coarse – but with usage it gets softer and lighter and for most people it will hold for a lifetime. And then there is one extra advantage, again, due to the lanoline it is more or less self-cleaning, so unless you stain it, there’s little need to wash it, just hang it outside to get some fresh air once in a while. An interesting fact shows, that inside damp Faroese wool it is actually 3 degrees Celsius warmer than outside. A fact the Faroese fishermen knew and used to their advantage. As they were rowing in open boats they were exposed to the cold northern winds and as to not get too cold hands for the rowing, they dipped the gloved covered hands into the ocean before embarking on their journey making the journey warmer, and more comfortable than otherwise. The yarn used for the Shisa Brand short Skipstroyggja is the natural Faroese yarn from free ranging sheep. The yarn is from the mixed wool, and although it has been washed and spun in a factory, it has gone through more or less the same traditions and process with respect for the good in the natural wool, minus the urine wash though. But Skipstroyggjan isn’t the only garment that the Faroese have knitted through history and still knit. The Faroese have a long tradition of hand knitting a wide range of garments with Faroese wool; jumpers for different purposes – indoor or outdoor, cardigans, tops, trousers, underwear, leggings, hats, socks, gloves, scarves even the national costume is in great part hand knitted with Faroese wool. 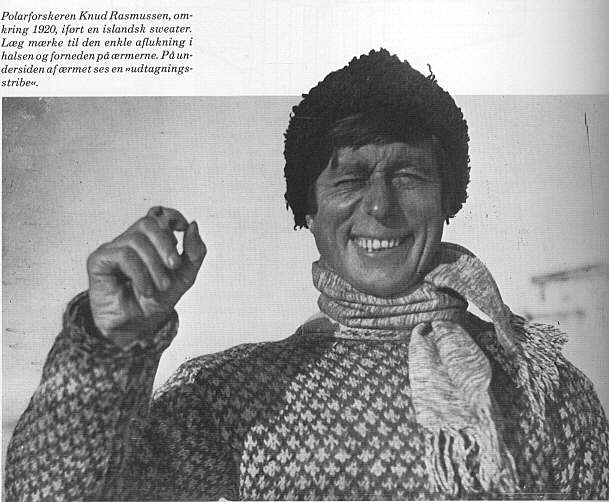 If you have interest in the traditional Faroese Jumper, and you read Danish, the article by Den velklædte mand, from which the photo of Knud Rasmussen is taken, Islænder, islandsk sweater – den overraskende historie is actually very interesting and accurate.